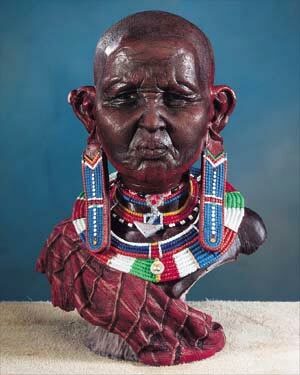 Massai Woman: Maasai women regularly shave their heads to attract attention to their abundant jewelry. For the symbol conscious Maasai, blue beads symbolize God as “the color of the sky where he lives, green beads represent vegetation after rainfall.” Beaded earflaps indicate that a woman is married. Her husband will never see her without them. (Approximately 6 3/4" Tall). Perfect for gifts and collectables.